So much yarn, so little time. : I win - you win! As you know, I love entering giveaways! Yesterday my prize from Maria's blog Scarlet Butterfly arrived. 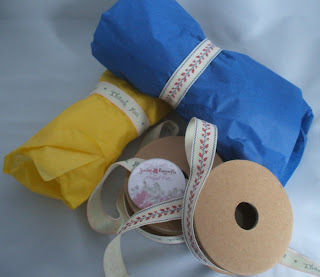 I had won a £10 voucher, and chose to spend it on some lovely ribbons to use when wrapping my sales. These are some Nativity Meerkats on their way to a new home!